This buyer’s guide compares and contrasts countertop materials on their environmental and health qualities, and provides selection tips. Use it to find the best green countertop material for your home. This buyer’s guide compares and contrasts countertop materials on their environmental and health qualities, and provides selection tips. Use it to find the best green countertop materials for your home. 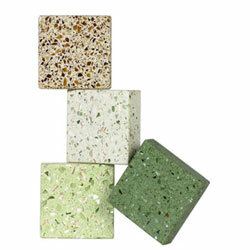 Recycled glass countertops are one of the more popular materials in this list. This material is also known as terrazzo. It consists of crushed stone and glass set in a cement or epoxy substrate that is buffed smooth. For specific product recommendations, see Sunset magazine's "Eco-Friendly Kitchen Counters" and consult the GreenSpec directory of environmentally preferable building products.